Woodcliff Lake, NJ – September 27, 2013...BMW Motorrad has taken trip planning to another level with the introduction of the new Navigator V. Featuring a new larger and brighter 5" TFT Display (800 x 480 pixels and 65,000 colors) than the previous generation NAV IV, the premium-class, Bluetooth-capable GPS navigation system is a reliable guide both on and off-road, whether traveling by motorcycle or automobile. Map zooming is finely graduated and offers navigational tools such as a lane assistant and 3D building display in many cities. Another routing feature is PhotoNavigation: Geo-coded pictures stored in the device can be clicked on to start navigating towards that location. The unit features a fully-fledged travel computer, a home function for fast routing to the home address and beeline offroad waypoint navigation. A free Garmin Smartphone Link app is available from Google Play and iOS. After pairing the smartphone with the Navigator V, users can receive weather and traffic information. The Navigator V is compatible with the free Garmin Base Camp route planning software, which can create routes and waypoints that can be tracked and transferred to the navigation device. Thanks to the four-button mount cradle, the waterproof and gasoline-resistant housing of the Navigator V can be mounted safely to the motorcycle and operated even while wearing gloves. On the R 1200 GS and K 1600 GT / GTL models, many functions can also be controlled directly using the multi-controller on the left of the handlebars. The Navigator V comes with preinstalled map data of North America and features lifelong access to map updates (Lifetime Map Updates - LMU). To better plan routes, users can download the Base Camp tour planning software free of charge at www.garmin.com or install it directly from the installation file on the navigation device itself. Memory capacity of the Navigator V can be expanded from 8 GB up to 64 GB using an additional SD card (not included). 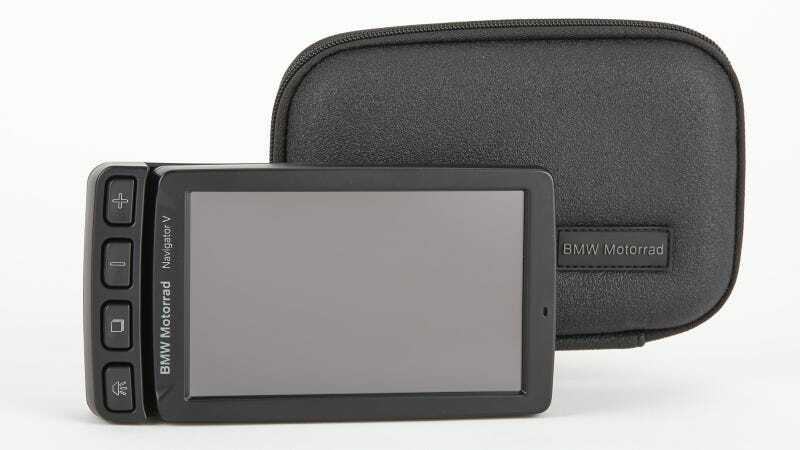 The Navigator V will be available in October for manufacturer’s suggested retail price of $799.00 for BMW models with GPS prep and for $899.00 with a cradle mount.